SeatGeek was definitely one of the finalists of the most recent TechCrunch50 conference that I thought were most interesting from a business model perspective. Apparently, I’m not the only one, as the New York-based startup has just closed a round of funding led by a group of four entrepreneurs/angel investors. The fledgling company, which bills itself as a ‘Farecast for sports and concert tickets’, had earlier raised $20k in seed financing from DreamIt Ventures, and has now secured in between $500k-$1 million more (no exact amount could be given due to some contingencies built into the financing). 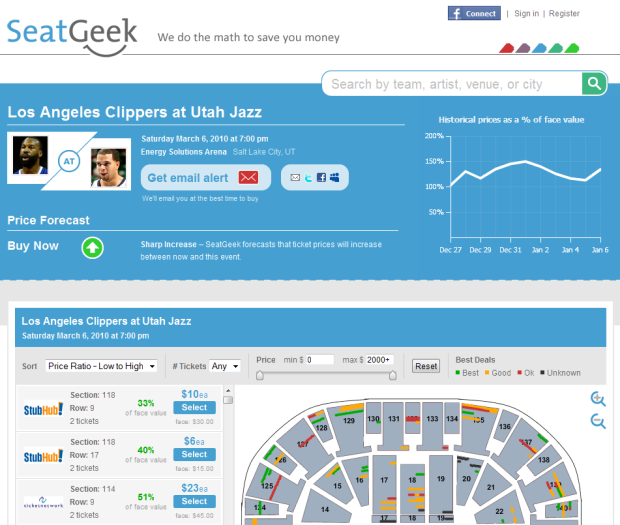 SeatGeek aims to predict pricing evolution of sports and event tickets sold on the secondary market, much like Farecast (now Bing Travel) forecasts the price of airline tickets. It attempts to do so using a bot that crawls hundreds of secondary market websites on a daily basis in combination with automated algorithms that take into account a very broad set of relevant factors, like for instance the predicted weather of a Saturday baseball game. This morning, SeatGeek launched a completely new version of its website, featuring interactive seating charts for ticket listings of some 5,000 events. These charts, built in partnership with SeatQuest, allow for ticket listings to be overlayed on the seating chart as dots, so that the user can see where they’d be sitting instantly. For sports events, SeatGeek goes beyond just indicating that with heat maps, coloring dots to represent how good a deal each ticket is based on its algorithms (example). In addition to the seating charts, the startup is launching an e-mail alert system that lets users sign up for notifications when SeatGeek’s forecast recommendation changes to a “Buy” and when tickets below a certain price become available. When SeatGeek launched at TC50, it boasted price forecasts for about 1,200 events, and thanks to an expansion into listings for the NFL, NBA and just about every major concert (NHL is up next), the startup now has forecasts for about 5,000 events. SeatGeek claims to have maintained a 82% forecast accuracy rate for all new events, which uses a database of historical ticket prices that has grown to over 11 million sales in the past few months. SeatGeek says the extra capital will primarily used for hiring – the team had already doubled in size since TechCrunch50, from four to eight. As mentioned above, the money comes from four NYC angel investors, namely Sunil Hirani (founder of Creditex, an online derivatives market that was acquired for $625M in 2008), Mark Wachen (founder of Optimost, an enterprise multivariate testing app acquired for $52M three years ago), Arie Abecassis (former President of MindFire) and Allen Levinson (former MD of Moody’s KMV).